fight for voting rights, democracy and social justice? Haiti’s struggle is our struggle. It’s now 50 years since the U.S. Voting Rights Act, but it’s been rolled back to systematically deny Black people the right to vote – again. In Haiti the 2015 elections were plagued by endless and well-documented ballot stuffing, vote buying, armed coercion, naked vote rigging – yet the U.S. ambassador gave his “OK” to the faked election results. 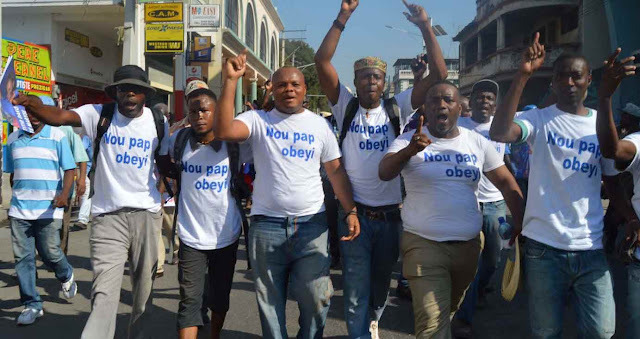 In effect, whether it’s here or in Haiti, the U.S. rulers are deliberately interfering with the people’s right to freely choose the representatives that they want. Haiti’s fight is our fight. Just as we in the Bay Area are fighting against police murder of Black people, so it is in Haiti. The State Dep’t wants to suppress the surging popular movement – using police terror against the people. During the 2015 elections, special US-financed police units sprayed machine gun fire into working-class neighborhoods in Port-au-Prince and Arcahaie to suppress the vote, killing scores of people. The U.S. State Department is the main actor trying to push through the fraudulent elections – maneuvering to exclude Haiti’s most popular political party – Lavalas – from any role in the next government. The U.S. wants to keep in power corrupt puppets who are willing to give away Haiti’s abundant mineral resources … privatize the mines and the electric company … and keep factory wages at US$3/day – continuing a long tradition of the U.S. and France stealing the wealth and the labor of the Haitian people.